Let’s face it! The holidays are upon us and that means there will be food everywhere. For some people, the holidays can be a source of stress because they are on a diet for health reasons. Thanksgiving is coming up and everyone loves a good cornbread recipe. Not only is this recipe easy, but the cornbread is delicious. It is also heart healthy. It only has 178 calories and 94mg of sodium. 1. Preheat oven to 350o F.
2. Mix together cornmeal, flour, sugar, and baking powder. 3. In another bowl, combine buttermilk and egg. Beat lightly. 4. Slowly add buttermilk and egg mixture to dry ingredients. 5. Add margarine and mix by hand or with mixer for 1 minute. 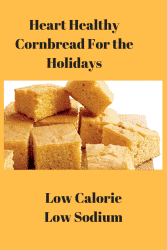 Delicious cornbread is a staple for home cooked meals. 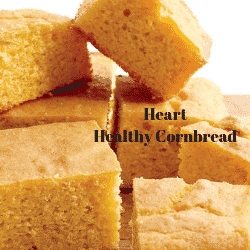 This cornbread is wonderful with homemade chili or any soups. Cornbread is also good with orange beef recipe. If you try this recipe, leave me a message to let me know how you enjoyed it!